This site provides information about the TERRA-REF project, including the experimental trials, data, and software that will enable advances in agricultural science and technology. Breeding is currently limited by the speed at which phenotypes can be measured, and the information that can be extracted from these measurements. TERRA REF is generating reference data sets from a variety of sensors and sensing platforms. 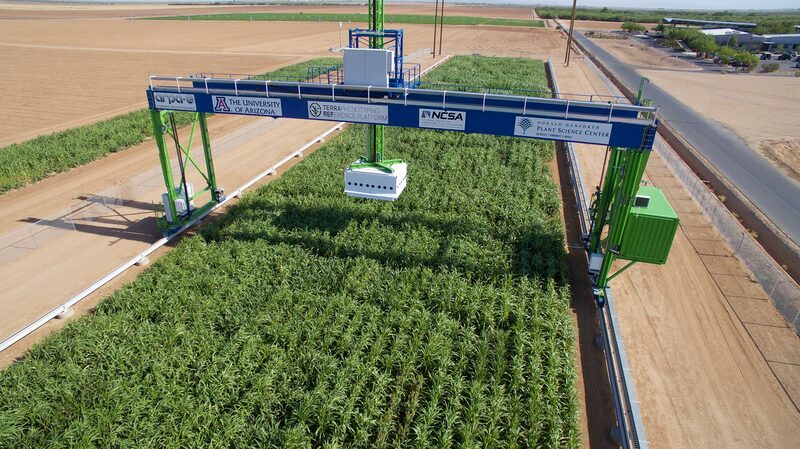 The World's largest agricultural robot collects data at unprecedented spatial, temporal, and spectral resolution. Indoor system measures over a thousand plants each day. Proximate sensing using tractors and push-carts. Whole genome resequencing and genotyping-by sequencing data from 100s of Sorghum and Wheat accessions. Fully open phenomics pipeline and data. Find more information about the scientific motivation and technical implementation as well as how to access and use data and software being developed by this platform.